Arm yourself for better, more productive workouts with these expert training hacks. Are you happy with your arms? Are they what you dream of, with the size, proportion and cuts that burst out of a T-shirt or rock a tank? If the answer is yes, well, go ahead and use those big guns to swipe to the next article. But for the rest of you, read on. The following seven tips have been pulled directly from the training trenches, where generations of guys whose biceps were once more molehill than mountain go to stoke arm growth. With these tips firmly in mind, you'll be ready to turn those scrawny little pythons into the envy of, well, of writers like me, for one. There's no shortage of biceps exercises in the world. 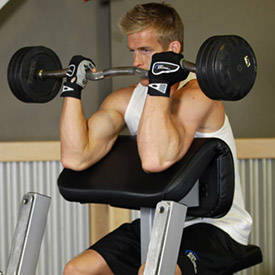 Being showcase muscles, biceps tend to get an outsized share of attention in the bodybuilding and fitness realm. Nearly all direct biceps moves (save isometrics) involve some sort of curling motion in which you flex the biceps muscle to bend the elbow—up to 90 degrees or more if you're doing a full rep. If you've been pumping away at those guns, but they're still at the same caliber, your curling form may not be up to the task. Go back to basics, such as a simple barbell or dumbbell curl, and watch your form closely. Are you bending your elbow as much as you can, or are you shortchanging the range of motion? Are you controlling the weight on the way up and the way down, or swinging to generate momentum? Locking down your form is the first step to take when your body isn't responding to your workout. Biceps are a key component of back training, and they get a lot of stimulus from intensive pulling exercises like bent-over rows, T-bar rows, pull-ups, pull-downs, and deadlifts. If you're not going all out on back day with a wide array of movements, you're missing a chance to overload the biceps muscles. 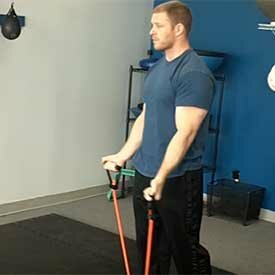 You can move a lot more weight during a pulling move than you can reasonably curl, so make sure your back routine gets your biceps both pulling and pushing. From now on, do your biceps twice per week. First, do 2-3 exercises at the tail end of your back routine, then hit biceps again in an arms-focused routine. The first workout takes advantage of the fatigue already built up during your back training, meaning you can succumb to failure faster. Arm-focused workouts take advantage of the synergy between biceps and triceps; by doing both movements in the same workout, you're drawing blood into the upper arm, which helps to deliver a stream of nutrients to speed up post-workout growth and repair. Consider adding close-grip pull-ups to your biceps routine, rotating between the hammer (palms facing one another), pronated (palms facing forward), and supinated (palms facing you) from workout to workout. This exercise works the lats as well as the biceps, using your own body weight to stimulate maximum muscle-fiber recruitment. Use pull-ups to lead off or even finish a workout, and be sure to take them to failure for at least the final set. Designed To Support Lean Muscle Growth And Rapid Recovery! Go Now! 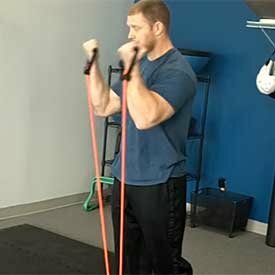 Band or chain exercises are potent ways to deliver new growth stimuli to your biceps, especially if your workout plan has gotten a little stale. You can curl a band directly, or hold one with both hands while gripping a free weight or machine handle. Either way, you're adding resistance that's more constant through a range of motion than with a barbell or dumbbell. Draping a chain over a barbell provides the same benefit, adding more tension as you lift more links off the floor. Compare this to the way your forearms can almost go slack during a standing curl, when the weight is perpendicular to the floor. Note: Hold a band on the last two sets for added resistance, or put a chain over each end. The chain should be long enough that links are on the floor. As you curl, you add to the overall weight of the exercise. Note: Hold a band during each set. Once you reach failure, let go of the band and continue repping with the dumbbell. Everything in the old intensity-booster bag of tricks is fair game when it comes to biceps. Negatives, partials, and supersets can make your biceps scream. But nothing makes them scream quite as loud as dropsets, which pretty much guarantee you've reached absolute muscle failure for any exercise. Drops are best when done multiple times. When you're on the last set of an exercise, rep to failure. Immediately lower the weight by 30 percent or so, and rep to failure again. Drop another 20-30 percent and rep to failure one more time, then do one more drop if you have it in you. It's torture, sure, but now you can be absolutely sure you didn't leave even one more rep in the tank. Those guns are spent and ready for repair and reloading. To increase difficulty, you can always lift heavier weight, but that comes with limits. At some point, you'll hit an upper boundary where you can't really handle more poundage—at least not with good form. But there are still other ways to torque up the intensity. 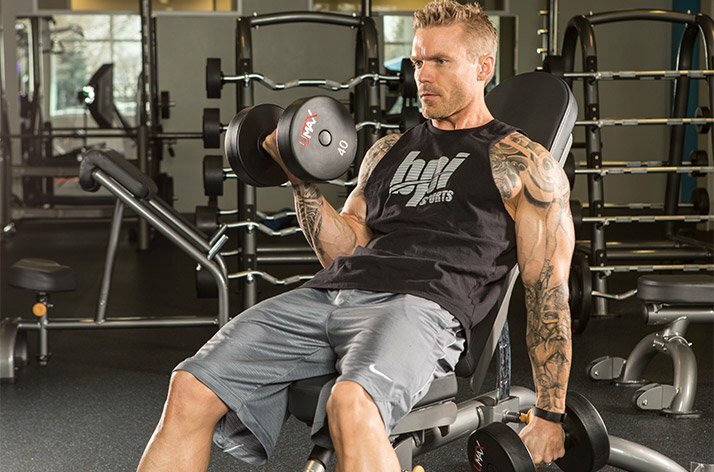 James Grage, co-founder and vice-president of BPI Sports, does it by cutting down on rest time between sets, including his supersets and giant sets. Grage likes to pair biceps and triceps exercises into supersets and give himself only enough rest to switch to the second exercise. "I don't really like to rest; I like momentum," he says. "When I do supersets for arms, the intensity is high and my heart rate is elevated." Too often, Grage sees people go to the gym and just check sets off their lists. "Make sure you train with focus and intensity," he advises. "Push yourself out of your comfort zone. If you hit a wall, rest or pause, shake it out, then get right in your head again." Shop BPI Products In Our Store!